In our post-September 11, 2001, society, environmental managers must now deal with a new and deadly threat to their environmental health and safety (EHS) programs. Weapons of mass destruction (WMDs) in the hands of terrorists must now be considered an imminent possibility and the devastating effects of these so-called "bugs, gas and nuclear" agents pose a threat to all aspects of our environment, from the air we breathe and the water we drink to the crops and livestock feeding our nation. Understanding the WMD threat and taking steps to deal with potential emergencies are the responsibilities of both government and private industry. Environmental managers and professionals in all fields must play a key role in this preparedness. It is their responsibility to keep abreast of the WMD threat and to ensure round-the-clock readiness to deal with potential incidents. The class of WMDs that could have the greatest impact on the environment is weaponized nuclear material that could cause widespread radiation poisoning. This article presents an introduction to the types of weapons terrorists might likely use; describes the damage that these materials can do in a complex society such as ours; reviews the involvement of government anti-terrorist agencies; and outlines preventive measures that the industrial community can take to reduce the impact of WMDs on the environment. While a terrorist attack with WMDs would probably be aimed at densely populated areas of our country, it is very likely that vital environmental resources would also be targets of any coordinated activity to incite civil unrest. In addition to the devastation wrought by chemical, biological and nuclear weapons on human life, they critically harm our natural resources, and the environmental community needs to be prepared to deal with an such an incident. Industrial chemicals from plant storage facilities or transport units can contaminate water supplies (reservoirs and ground water); water-stable biological agents can also harm drinking water. Releases of gases and airborne agents (intentional or accidental) can seriously affect air quality, damage vegetation and wildlife and disrupt agricultural operations. Radioactive releases can contaminate soils and buildings, restricting the use of land and infrastructure until contamination is removed. Incendiary devices and flammable liquids can cause forest fires, destroy agricultural facilities and threaten crops. Disease-causing pathogens (e.g., anthrax) can damage crops and livestock, as well as farm workers. Botulism organisms can contaminate agricultural soils. Easily transmitted organisms that cause veterinary diseases (mad cow; hoof-and-mouth; brucellosis) can impact livestock production and milk supplies. Chemicals, nuclear materials and explosive devices can cause serious physical damage to industrial, commercial and agricultural facilities. Mass destruction of wildlife and livestock by WMDs can result in collateral problems from decomposition of animal flesh and an increase in vermin population. During the last 10 years, U.S. Congress has passed legislation making it a federal crime to use, or threaten to use, weapons of mass destruction. This legislation also has funded domestic preparedness training programs, equipment grants and interagency coordination in the detection, prosecution and response to terrorist incidents. In September 2001, President Bush gave former Pennsylvania Governor Tom Ridge and the new Office of Homeland Security the job of managing government initiatives to deter and respond to terrorist attacks. This federal agency will strengthen our defense against WMDs by coordinating the work of the dozens of federal, state and local agencies that are now active in anti-terroristic operations. The National Domestic Preparedness Office (NDPO) assists state and local response organizations with planning training, equipment and support necessary to respond to conventional and non-conventional WMDs. The U.S. Department of Justice's (DOJ) Office of State and Local Domestic Preparedness provides grants to help local organizations improve their response programs. Funds are provided to ensure that first responders (e.g., fire, medical and emergency teams) are properly equipped to handle terroristic incidents involving toxic agents. The State Agency Domestic Preparedness Equipment Acquisition program provides funds to expand equipment and training programs for local response teams. The funds are made available through state governors' offices. The Awareness of National Security Issues and Response program (ANSIR), initiated by DOJ, is the "public voice" of the Federal Bureau of Investigation (FBI) on counter terrorism and other issues of national security, including espionage and foreign intelligence activities. Each of the 56 FBI field offices has an ANSIR coordinator who provides information on a regular basis to corporations in its area via fax and e-mail. ANSIR currently communicates with approximately 25,000 businesses in the United States. Industrial chemicals from plant storage facilities or transport units can contaminate water supplies (reservoirs and ground water). 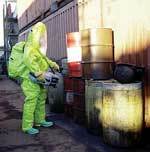 Several other government agencies and industry associations provide information that is useful in planning for WMD incidents. These include the U.S. Department of Defense, the Agency for Toxic Substances (one of the Centers for Disease Control) and the American Chemistry Council (formerly known as the Chemical Manufacturers' Association) (see sidebar). As a result of these and other programs, the country's HazMat units, fire departments, EMS units and plant safety teams are becoming better trained and better equipped to contain the threat of WMDs. In the aftermath of recent terrorist events, prudent managers will be wise to consider the effects of a terrorist incident when updating their EHS programs. As with any threat to the safety and environment of a plant community, the WMD hazard is best handled with a structured plan that addresses both prevention and incident management. Stage 1 -- Hazard Analysis and Planning. Safety and environmental teams should become familiar with the different types of WMDs and how to identify their effects on humans, animals and the environment. Conduct a survey of the plant community to identify facilities that might be potential targets for terrorist attack. Know your strengths and weaknesses. Based on these findings, develop detailed plans for facility protection and incident response. Stage 2 -- Active Prevention. Monitor the plant site for the short- and long-term effects of WMDs. Sample air quality; take ground water samples; test for soil contaminants; observe animals and vegetation in the community. Enforce plant security. Control entry and exit to plant facilities and processing areas. Limit access to any areas that contain hazardous chemicals, flammable liquids or other materials that could be used as a WMD if released intentionally or by accident. Tighten controls on incoming and outgoing shipments of hazardous materials. Train drivers in security measures while on the road. Educate employees in the threat of WMDs, how to identify them and ways to protect themselves against their effects. Provide a sufficient inventory of personal protective equipment (PPE). Act now to establish a support network of local fire, emergency, medical and law enforcement agencies. Stage 3 -- Crisis Management. Develop a plan to respond to the most likely WMD incidents should they occur, such as highway spills, chemical vapor releases, plant fires and explosions. Consider worst-case scenarios, and establish a formal incident command structure that can be implemented on short notice. Train, equip and rehearse your plant emergency response teams to deal with incidents involving WMDs. Special training is available at HazMat seminars and EMS conferences sponsored by local and national safety groups. Make sure the right type and amount of equipment is available for effective, safe response. Stage 4 -- Consequence Management. Be prepared to handle the casualties and environmental damage that might result from a WMD attack in your area of responsibility. Coordinate follow-up with local medical, emergency and environmental agencies. Involve treatment facilities, remediation contractors, law enforcement and other organizations that might be needed after the event. Identify the members of this support network before an incident occurs. Now is the time to establish communications links with other local response groups that will be involved should a WMD incident occur in your area. Your allies in response include fire and police departments, local emergency response teams and medical treatment facilities, as well as your state office of emergency management. Local emergency planning commissions established by the U.S. Environmental Protection Agency (EPA) also should be part of your support network. Seamless communications and coordination among members of this response network will be critical in dealing with the potentially devastating effects of a WMD attack. It's important to accept the possibility that an incident can happen and that a coordinated effort will be essential in successful response. Start now to develop the contacts and relationships that will build an effective response alliance in your locality. A terrorist attack involving WMDs can best be described as a combination hazmat incident and mass-casualty incident rolled into one. As terrifying as this scenario sounds, most hazmat response organizations are already trained and equipped to meet the challenge. Experts agree that current protective equipment technology should be more than adequate to counter the effects of WMD terrorism. Rather than purchasing new PPE, response teams should build a sufficient inventory of traditional protective apparel to accommodate the increased number of personnel that may be required to handle a mass destruction incident. In addition, a WMD incident would increase the need for modesty garments for victims with contaminated clothing and for responders who must discard contaminated protective garments. For this reason, an increased inventory of protective coveralls should be included in the plant's emergency wardrobe. Many industrial chemicals on our highways and railways daily en route to manufacturing plants and distribution points throughout the country can be hazardous to humans and the environment if not handled and stored properly. These include ammonia used in refrigeration systems, chlorine and sulfur dioxide for water treatment, hydrochloric and sulfuric acid used for metal cleaning and dozens of other common chemicals -- both liquid and solid that contribute to our unmatched standard of living. In the hands of a terrorist, they can be used to pollute water supplies, contaminate agricultural land, poison livestock and decimate forests. Considered by many experts to be even more deadly than chemicals are the various types of biological agents that can be unleashed against populations, food supplies and agricultural operations. For example, biological toxins such as botulism, ricin and staphylococcal enterotoxin B, can be easily produced in a small laboratory and used to poison metropolitan and farm communities. Equally dangerous are biological pathogens, which can be cultured to spread death and disease in humans, animals and vegetation. Examples include anthrax, smallpox, cholera, plague and Salmonella. Without doubt, the class of WMDs that could have the greatest impact on the environment is weaponized nuclear material that could cause widespread radiation poisoning. Of concern are the radioactive isotopes commonly used in nuclear medicines to treat disease, as well as the industrial radioisotopes used in scientific measuring equipment. These and other non-military radioactive materials could be dispersed by terrorists using explosive devices, spray or dusting techniques to cause radiation poisoning in a selected target area. Explosive materials, bombs and flammable liquids are the most widely used types of terrorist weapons. Availability and ease of use make these WMDs the most uncontrollable and dangerous threat in our society. Included in this category are TNT, dynamite, water gels, sporting powders and plastic explosives. Dual-use materials, such as fertilizer and fuel oil (ANFO), gasoline, liquefied petroleum gas (LPG) and other flammable gases can also serve as explosive WMDs. The following industry organizations and federal agencies offer information that can be useful in updating Environmental Safety and Health (EHS) plans to cover incidents involving weapons of mass destruction (WMDs). The Office for Domestic Preparedness provides technical and training assistance; information on equipment acquisition grants; exercise development and support. The FEMA Web site contains the detailed Concept of Operations Plan (CONPLAN), which describes the coordinated response planned by federal agencies in the event of a terrorist threat involving WMDs. Contact WMD coordinators in local FBI offices for information involving plans for incident response in specific areas of the country. The FBI Web site contains a copy of the Congressional Statement "Terrorism: Are America's Water Resource and Environment at Risk?" The FBI Web site also provides access to information about preparedness training programs available from the FBI, the U.S. Department of Defense (DOD) and the National Cyber Crime Training Partnership. Information also is provided about anti-terrorism activities of the National Infrastructure Protection Center (NIPC). This Web site contains a series of 90 charts from the presentation "Chemical, Biological, Radiological and Nuclear Terrorism: Organizational and Operational Response." This article appeared in the May 2002 issue of Environmental Protection, Vol. 13, No. 5, page 19.